The Beurer WL 80 wake-up light wakes you from sleep in a gentle and natural manner. The LED light gradually becomes brighter like a rising sun, allowing you to slowly become accustomed to the light conditions and your body to gently prepare itself for waking up. You can also set an alarm tone that is sounded following the simulated sunrise and provides an acoustic aid to help you wake up. You can choose between the radio or various sounds. You can connect an external audio source (e.g. 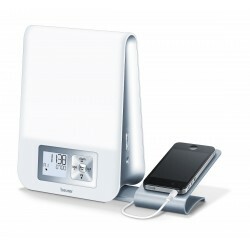 MP3 player, smartphone or CD player) to the wake-up light via the AUX input. You have the option of connecting a USB stick (up to 32 GB) to the wake-up light via the USB connection, enabling you to listen to music. The device can play the following file formats: MP3, WMA and WAV. 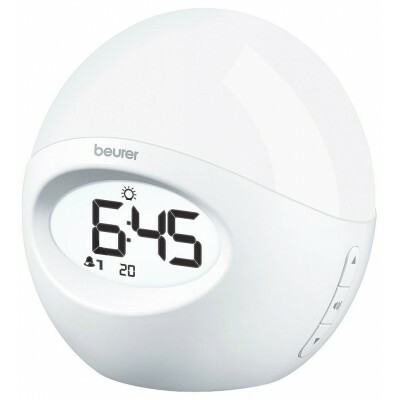 The Beurer WL 80 wake-up light provides a rested and pleasant start to your day. A healthy sleep and restful awakening act like a source of strength for everyday life.